In keeping the theme of combat in Christianity, here's a little lesson in ancient etymology. Israel, defined in Hebrew is most commonly translated as “God prevails” or “Soldier of God.” Another reading of the word reveals that it is from the verb: Sara, or “To contend.” From this we derive my favorite translation: "Wrestles with God." Sara is not just a verb however. It is also a noun meaning wife of a noble king, princess, or noblewoman. How perfect that the title of Israel should be born of “Sara” God’s proper name for Abraham’s wife, the matriarch of Judaism. Women are fighters after all. They contend with childbirth, a more painful experience than any warrior is likely to come across. But back to Israel. Why would God name his people in honor of struggling against himself? Then the man said, “Your name will no longer be Jacob, but Israel, because you have struggled with God and with humans and have overcome." This verse comes as Jacob is at a low point. Banished from his country, Jacob has been fleeing his brother Esau for over 20 years. He toiled in service to a selfish man in order to secure a bride. He was tricked and dealt with shrewdly, ending up with multiple wives when he had only desired one. He was at last freed from his burden, and in return for his diligence and unceasing persistence had acquired a fortune. All of which was gained through struggle. Even in departure, he had to run from his father-in-law, Laban, who selfishly pursued him in avarice for the fortune Jacob made in his service. God prevented Laban from doing Jacob harm, and through a vigorous debate, Jacob conquered Laban’s selfishness and they entered into a peaceful covenant. Finally free of his oppression, Jacob sought to return to his homeland where Esau was waiting. Jacob is terrified. He sends peace offerings to Esau, and emissaries bearing words of peace, but he does not know how his words will be received. Indeed, no response came from Esau or his band of 400 men. These men were bearing down on the smaller camp of Jacob, which trembled in fear at the idea of Esau’s absolution. Then Jacob prays, and is visited by a man in the night. They wrestle. They struggle with one another a solid 8 hours of moonlight before arriving at a stalemate. Just when Jacob thinks he might have the upper hand, this strange grappler hits him with a super-secret pressure point attack and pops his hip out of joint. For those unfamiliar with the painful rigors of intense grappling, you can’t imagine how painful or demoralizing it would be to have an enemy gain so much ground on you in so quick an instant. A joint out of socket is an intolerable handicap in a wrestling match. You have no base from which to attack or defend without the full use of your hips. The only reasonable thing to do in such a situation is tap out and submit. But that’s not what Jacob does. He refuses to let go of his opponent and demands a blessing. Even in utter defeat, Jacob holds fast. His persistence is admirable, and so the man, or angel, or God himself, blesses Jacob and renames him Israel. Just to review: Jacob has lived a contentious life in which he sins against his father and brother, steals away in the night like a coward, and spends two decades in servitude to a selfish man who not-so-coincidentally reflects Jacob’s own arrogance. He struggled his entire life to overcome his circumstances, first by grasping a birthright, then by pursuing a woman, and finally he struggles to attain forgiveness and redemption in his own brother’s sight. All of this struggle, all of this fighting, and all of this contention culminates in a single night, in a single arduous match against Love Himself. Because Love is a struggle. Understanding who God is, and overcoming who you are, is a knockdown, drag-out, no-holds-barred brawl. 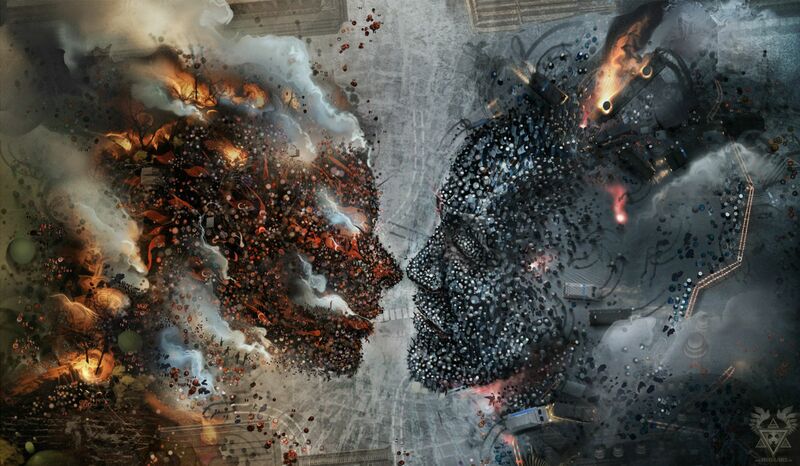 A one-on-one war that leaves everyone broken, bruised, scarred, scattered, and fundamentally changed. Wrestling with God is no laughing matter. It is not an undertaking for the weak in spirit or the soft of heart. In my time practicing the martial art of wrestling, I was privileged enough to encounter some of the highest level grapplers alive. I went and trained under Olympic medalists Tom Brands and Dennis Hall during their week long boot camp at the University of Central Tennessee. I felt the grip and power of world class athletes and sensed the gap between their skills and mine. I felt the overwhelming powerlessness of a child contending against someone with a lifetime of world-class competition and training. I felt and I trembled. But I never gave up. That is what it means to contend with God. To wrestle with the Holy Spirit as life’s troubles, travails, and its chaotic relationships batter you back and forth, etching scars of integrity across your soul. Every mark is a badge of honor. Every wound is a tool for growth. Every busted lip, bloody nose, broken limb, and shattered bone is a lesson that can either overwhelm or be overcome. God plays rough. Because he doesn't want wimps on the front-lines of his armies. He wants soldiers, hardened by battle and steeled by flame. Our Lord is a healing force of light and life. He is often compared to the elements in an attempt to capture an echo of the essence of his presence. He is a consuming fire, a torrential flood, a mighty wind, the foundation of strong earth. How does one grapple with a hurricane? How can you shoot a double leg on a wildfire? What chance do you have trying to put an earthquake in a headlock? Yet this is what Jacob does, and this is what God asks us to do. And through this process we are shaped into powerful men and women of God. Amazonian warrior priestesses and herculean champions of virtue. This is what you are called to be, this is who you really are. Heroic. You are soldiers in the army of Christ who bring the Kingdom down to earth by living your tumultuous lives in the dignified, unflinching, and implacable pursuit of higher ideals. Never forget your responsibility. Never abandon your struggles. Always acknowledge your challenges and smile upon them. Grit your teeth at the enemy and laugh the mad laughter of one who is hopelessly outmatched, yet unwilling to retreat. It is our lives that we gamble with. It is our souls that we brandish as swords, and cry out in unrelenting passionate fury for. It is God who sustains us, and we cannot be defeated. So a little bit about me: I love fighting. Not in a macho, worked up, too much testosterone, "let’s pick on some people we don’t like at a bar" type of way. No no. I like martial arts. I like a good boxing, wrestling, MMA, jujitsu, or kickboxing match. I love the stuff. I blog about it constantly, and train to throw high kicks with competency at my every convenience. What I love most about it is the struggle. The heart that a competitor puts into his performance. I have a great amount of respect for anyone who wants to put their health on the line for a little bit of money and the sound of screaming fans. I am a screaming fan. I’m amazed at how often I can look into a fight and see a life lesson. Everybody remembers getting inspired when Rocky went the distance with Apollo Creed, right? And then subsequently less inspired every time they made an exponentially more ridiculous sequel--- but then back to hyper-inspired in Rocky IV, because we just couldn't stand the USSR in the 80’s! The thing I love most about watching the best fighters in the world compete is the idea that anyone is capable of surpassing their own limitations. Not just through hard work but through the acknowledgement of God's handiwork in individual lives. 9 times out of 10, a guy that busts his hump for 8 straight weeks in preparation for 15 minutes of hand to hand combat, in front of a live audience of thousands of people, and millions more watching around the world-- and this modern day gladiator will get down on his hands and knees and thank God that he is in there, living his dream, and for the moment, victorious. Kind of counter intuitive, isn't it? You’d think after using your own hard work, determination, skill, athleticism, and innate ability to prove your mastery over another human being that you would begin to feel a bit… arrogant. But most of the time, it’s just the opposite. They are humble, thankful, respectful, and happy for the blessings that have been given them this day. I suppose that humility is sort of inevitable when you spend your days simulating situations where you're being choked or bludgeoned to death by other grown men. Nothing is more humbling than having an all out scrap with someone and coming up short, and it happens to these guys EVERY DAY. I find it at the very least, surprising. At its zenith, I think this kind of thing is admirable. This is an interesting verse, particularly the phrase “all your strength.” Strength is translated from the Greek verb: ἰσχύς. Transliterated that’s: ischys, and read aloud it sounds nothing like either of those are spelled. However, it doesn't have as narrow a definition as one might imagine. A thorough reading of the word reveals this meaning: To the extent of one’s ability. To put it another way, pushing yourself to the limit of your endurance. She’s as dead on with this estimation as she is with her high notes. Loving God isn't easy. It’s a life or death struggle, quite literally, and putting all of your strength into it means pushing harder every day. Building your endurance, your capacity to love, empathize, sympathize, and appreciate all that is around you. It’s a battle to block out negativity, to refuse to judge your brothers and sisters, and to stand up for what is right. It's not exactly an easy endeavor, but that’s the battle we are called to engage in. And that competitive spirit, that overwhelming urge to get your hand raised when the bell rings is the most blatant archetype of this concept that I can point out to anyone. It's one the resounds as well. People are used to fighting our entire society is built on the competitive spirit. History, in fact, is just a long list of fights and who won them. It may be that human beings are deplorable for so romanticizing violence, but at the same time, there's an innate romantic quality in there. Without battle, without struggle, there can be no triumph. And what has God called us to be if not triumphant? Not triumphant over one another, dominating the weak with injustice, but triumphant over ourselves with discipline, restraint, and passionate love of God and our fellow man. The latter of these, I have found to be a formidable opponent, but that's the only kind that makes my blood boil. It's the hopeless situations that must be overcome. It's the darkness enveloping us that makes God's light shine so blindingly. God is inspiring because he is a defender, a provider, and a fighter. He never gives up on anyone or anything. In my humble estimation, we should go and do likewise. So put your hands up and greet the world with a jab to the throat. You've got a lot of obstacles to overcome, and giving up just doesn't seem like such an attractive option. WELCOME TO THE HOTR BLOG! Welcome to the House of the Rock Blog. Here you’ll find some uplifting, inspiring, thought provoking, and hopefully very interesting posts about our faith and our community. Poetic license to be consistently taken, in some cases abused. In depth looks at what scripture has to tell you. A passionate and affecting point of view concerning a life of faith. An open-minded and non-judgmental approach to walking with God. And possibly some delicious recipes for tasty and healthy foodstuffs. We’re batting around a lot of ideas for what’s first, what’s next, and what might be fun to talk about. And as always, reader interaction is encouraged. For a community to be successful it’s pretty much required! For my part, I promise to offer you my honest struggle. The way I process the world in all its horror, wonder, misinformation, beauty, chaos, confusion, character, division, unity, strife, and situational comedy is by writing it all down. Working through it by reading it back to myself, and cutting away the fat of confusion until I’ve got a lean tasty looking opinion sitting on the screen. I’m not an authority, not an expert, not even a journeyman really. But what I am: is curious. I aim to show you my curiosity about God, and hopefully engender a little curiosity on your end too. So strap in, folks. I’ll be around for a while and you’ll all be joining me for as long as you feel like reading the wordy sporadic ramblings of an elevated vernacular that compose my writing style. I hope to begin conversations and remove doubts about the one true savior of all mankind. So say a prayer for me, and let’s walk together for a bit on this long, strange, and narrow path.